The world of medium format digital cameras systems is one that is typically associated with either very hard working professionals or well heeled amateurs (or well heeled lazy professionals I suppose). However as the the earlier generations of these cameras and backs circulate through to the second hand market, the prices are starting to look competitive. But just how good are they if you compare them with what you can get from a modern, high-end DSLR? 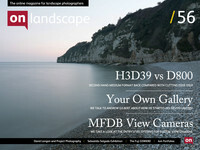 Well Andrew Nadolski and I went out in Devon to have a look at the differences but with an obvious strong slant toward landscape photography. To this end we tried the cameras on a shingle beach scene and then the following day we wandered into Dartmoor and visited Hexworthy Bridge on a wonderfully challenging rainy day. First though we had to choose a modern, high-end DSLR to compare it with and the choice was fairly obvious as both me and Andrew had the Nikon D800 (non-E version - although that shouldn’t matter from our previous side by side tests and we’re using f/11 and f/16, typical landscape apertures). It’s widely accepted as the highest quality that DSLR’s have to offer and we could test it with the Nikon 50 f/1.8 G - a stunning little lens. The planning didn’t take too long and quite soon we were ready. “Beer first then!” Andrew said. “Well always” I replied “but I thought we were driving?”. The next part of our test looked at the possibilities of using the Hasselblad digital back as part of a system. Click here to continue.